You’ve been sitting at your desk all morning struggling to think of new, creative ideas for your project. Finally you get up to grab some water; you walk down the bright hallway featuring oversized abstract paintings filled with all the colors of the rainbow. You pause to look at a large canvas that fills the wall, your eyes tracing the lines as one color flows into the next, a series of bright shapes positioned together hovering over a dark background. The emotion within the painting mixes with the lingering brainstorming session you just left at your desk. You have a new idea! After a moment you continue to the kitchen to fill your glass and head back to your desk feeling a sense of renewal and refreshment from your work rut. For almost three years, AdvantEdge Business Centers’ Downtown location has been the base of operations as well as contemporary art space for Aaron Gallery. Since it’s opening in 1974, Aaron Gallery has been a thriving fixture in the Dupont Circle neighborhood, showcasing vibrant Abstract Expressionist painting and sculpture. Founded by Consuelo Aaron, a pioneer in various art movements across America since the 1960s, the gallery is currently owned and operated by Aaron’s daughter Annette. 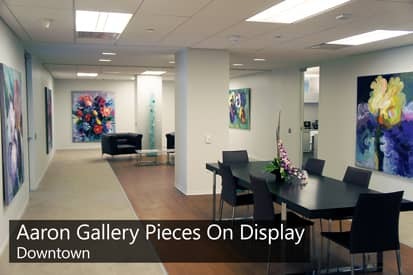 A by-appointment-only business, Aaron Gallery occupies multiple floors of the 2101 L Street building and supplies the artwork for AdvantEdge Business Centers’ Downtown and Chevy Chase locations. “The artists are so happy to be represented by Aaron Gallery. Though an office environment is not a conventional gallery style space, the artists are happy to show their work in a space with no rules or restrictions. I am thrilled to be able to share these beautiful pieces with the many businesses that work here each day,” said Annette. 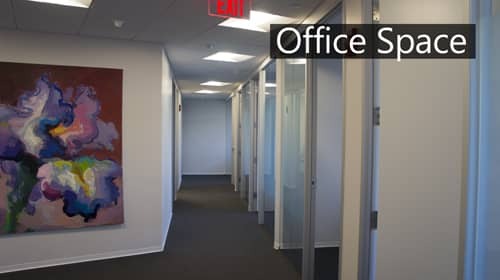 A unique client providing a glimpse into the DC art scene, Aaron Gallery uses AdvantEdge office space for their business headquarters as well as wall space throughout the suite to showcase the gallery’s extensive collection. By providing storage and office space in a secure environment, as well as meeting room space on demand, the Aaron Gallery benefits from the flexibility and business services that bring many companies to executive suites while other businesses benefit from the gallery’s fine art. On Thursday, May 15th the Aaron Gallery debuted its latest exhibition “Chromatisms,” featuring thirty new works from acclaimed DC artist Javier Cabada. Specializing in large, colorful abstract painting, Cabada’s art has been celebrated around the world from Moscow to Bangkok. Cabada’s works are prominent throughout the AdvantEdge Downtown location and the exhibition will be on display through June 30th. “We are thrilled to see “Chromatisms” come together- I could not have done it without the help and support of AdvantEdge and my team of dedicated assistants that work with me throughout the year. As a gallery we strive to educate as well as provoke a thought from those that view the artwork; these pieces are more than just pretty pictures on a wall,” said Annette of how AdvantEdge helps the Aaron Gallery celebrate its passion for fine art. With the Aaron Gallery, AdvantEdge creates modern and inspiring workplaces for companies from a variety of industries. Our centers are designed to motivate those who use our spaces every day and impress visitors coming to meet our clients. AdvantEdge is proud to collaborate with Aaron Gallery to maintain a modern, unique, high end office environment. The Aaron Gallery is a contemporary art space committed to bringing the public the finest Abstract Expressionist painting and sculpture. It proudly represents many local and international artists who range from emerging to mid-career in addition to a wide variety of medium. The gallery was founded in 1974 by Consuelo Aaron in Washington, DC and continues to be a prominent fixture of the DC art scene. Additionally, the gallery provides art consulting, estate sales management, and curatorial services. Javier Cabada has the honor of maintaining exclusive representation at Aaron Gallery and has been exhibited at many museums and galleries nationally and internationally. His paintings have been on view at Aaron Gallery for over 25 years and continue to be shown today. Cabada works and lives in the DC area.